Summary: For over a quarter-century the Left has sought public policy changes to fight global warming and the resulting climate change, relying largely on alarmist forecasts. Increasingly wild forecasts, disconnected from the work of climate scientists, the IPCC, and the major climate agencies. What have they reaped from this massive commitment of resources? The answer might affect America’s broader political evolution and the balance of power between Left and Right. 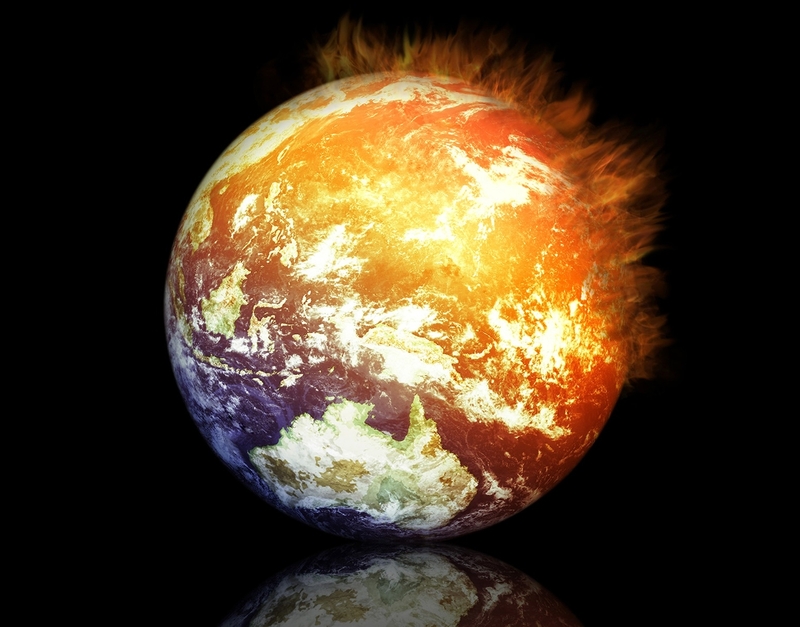 “Earth doomed within 20 years due to climate change“, UK Metro, 10 October 2013 — “Life in parts of the planet will start to be wiped out by climate change within two decades – far sooner than previously predicted, research shows.” The article refers to “The projected timing of climate departure from recent variability” in Nature (10 October 2013), which says nothing remotely like that. Since 1988 the Left, and its sub-community of environmentalists, have increasingly focused on fighting climate change as their primary issue. In a sense, they’ve wagered their credibility and political capital on this one issue. How’s that working for them? The polls show the answer. This is what losing looks like for the Left, and perhaps for environmentalists. See the results of a Gallup survey of Americans on 6 – 9 March 2014. Climate change is 14 of 15 (the rank order probably matters more than the specific numbers). 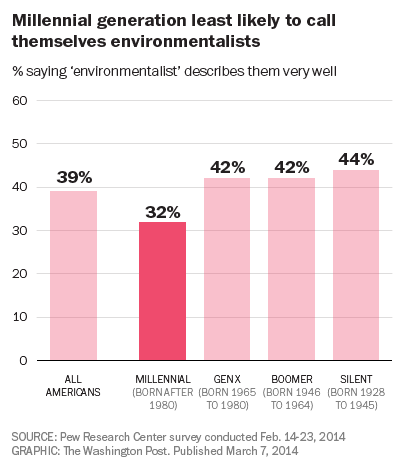 Note that the answers to “do you worry about climate change” are quite different when asking only about various environmental problems (see this Gallup survey). People say they worry a lot less about the environment when these issues are placed in a larger context. Large policy changes in America almost always require bipartisan support. That’s not happening in the climate wars. 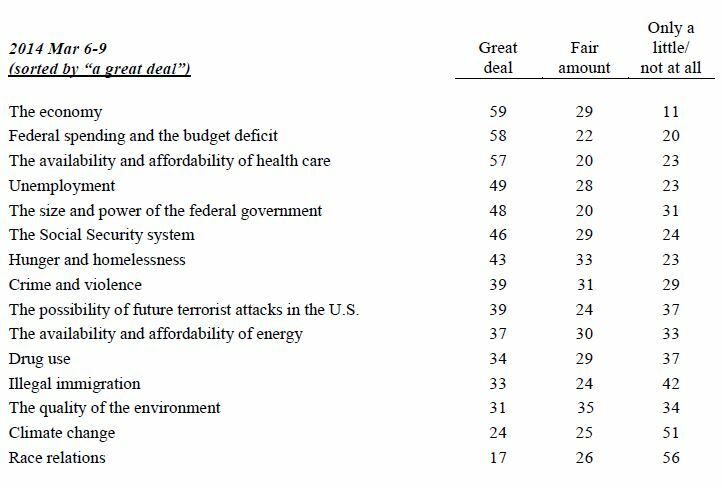 See the answers to how many people worry “a great deal” about major issues, by political party. 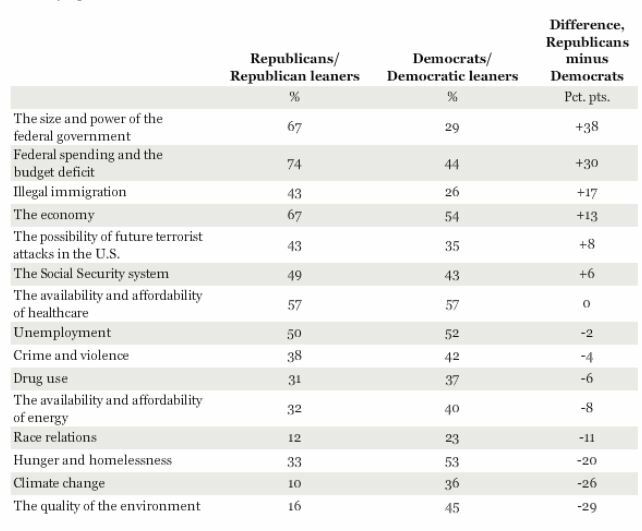 Climate change has the 4th largest partisan difference of these 15 issues. — “Elegy for a Country’s Seasons“, Zadie Smith (British novelists), New York Review of Books, 3 April 2014. I asked the author if it was OK to write about climate change “Without even bothering to cite any science? As fantasy? With amnesia about historical weather patterns & events?” Her reply: “yes“. More possible evidence that public support has decreased for radical policy action about climate change: “Alex Sink Rides Global Warming Alarmism to Surprise Congressional Defeat in FL-13“, James Taylor (Heartland Institute), Forbes blog, 12 March 2014. See this television ad from the $350,000 campaign by the LCV Victory Fund and the Sierra Club Political Committee. Quite righteous. But there is no climate science consensus on the relationship between the “polar cold” and global warming — let alone anthropogenic warming. There are papers in the peer-reviewed literature on both side of the issue. Ditto for increased storms and accelerated sea level rising. No surprise, given the small magnitude of the warming since 1950, after which “human activities caused more than half of the observed increase in global mean surface temperature” (from the latest IPCC report). — Good Leftist Keith Kloor gives the mildest possible criticism of Leftists’ unscientific alarmism in “The Inevitable Failure of a Climate Change Message“, blog of Discover, 14 March 2014 (the title is bolder than his analysis). “Civilizations in the final stages of decay are dominated by elites out of touch with reality. Societies strain harder and harder to sustain the decadent opulence of the ruling class, even as it destroys the foundations of productivity and wealth. Does poorly justified alarmism, no matter how good the cause, deserve to win? Polls suggest it is not winning. The Left is gaining neither immediate political advantage from these tactics, and might lose even more in the future. Worse, they might be damaging our ability to prepare for both normal weather (we’re not prepared for the past) and for possible future climate change. The boy who cried wolf damaged the village’s defenses against wolves. And a wolf eventually came. 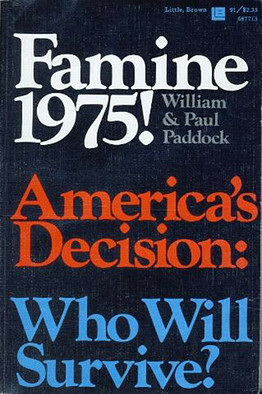 See Wikipedia for details about Famine 1975! America’s Decision: Who Will Survive? Every time I reveal my secret identity — Climate Mom, defender of Earth, crusader against carbon-spewing bullies and their slack-spine political minions — I’m surrounded by New Deniers. But I can neither tolerate pain nor willingly traumatize children, so I ditched that idea. My friend Peter Bocking once said that if Al Gore’s hair were set on fire it would provide enough heat and light for a small English village. The Left’s GW fears are asking for changes in a way of life that is decades even centuries old –a much tougher nut. GW is a problem on a scale like no other I can think of, it makes sense that there would be resistance to accepting it. If the Left did drop the fear element, I question the likelihood that support for doing something about GW would go up. In each issue on that poll list there is an element of fear, this seem inherent with any list of political issues. (1) The Right’s use of fear is not just in the WOT. That’s been a basis of their racial and ethnic policies — fear of the “others”. I suspect that these fears, especially of the Black underclass, are more fundamental to their success since their internal revolution in 1964. I totally disagree. Fear is our reaction to problems, not “inherent” in any situation. More specifically, what is special about the current situation is that appeals to fear dominates how our leaders seek our support. That’s unusually historically. I suspect that past leaders would have been seen as weak if their speeches were based on fear. I doubt you can find much support for that view from the climate scientists’ Working Group One of the recent IPCC AR5. The economic problem of the great depression, the threat of fascism, the near-brushes with atomic Armageddon during the cold war, the war on poverty, the great rollback of pollution in the developed nations during the 1960s – 1970s (continuing today) — these are very different problem, but on a scale as large or larger than global warming. BTW, FYI, perhaps you are aware of this — the world has been warming since the early 19th century; anthropogenic warming has been significant only after WWII. Per the IPCC “human activities caused more than half of the observed increase in global mean surface temperature from 1951 to 2010”. I doubt that it lies within our power to substantially affect the natural component of warming.